Shawnee State University’s Brooke Smith (Wheelersburg) qualified for the NAIA Nationals in March, along with SSU’s Seth Farmer. Tiffin, Ohio – Seth Farmer and Brooke Smith both qualified for the NAIA Indoor Track & Field National Championships as men’s and women’s track and field competed at the Tiffin Alumni Invitational Saturday. 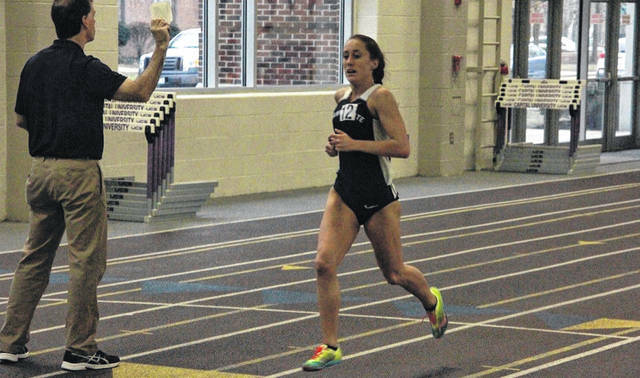 Farmer met the NAIA “A” standard in the one-mile run on Saturday. He finished in second place overall with a time of 4:18.73, nearly one whole second ahead of the 4:19.50 standard. SSU also got a strong finish from Hunter Bennington, who placed fourth in the 800-meter run with a time of 2:03.34. Josh Metzung placed third in the 5000-meter run with a time of 15:43.15; Steven Adams placed fifth in the same event at 15:56.80. Brooke Smith placed second overall in the women’s 3000-meter run, running the race in 10:17.10 to meet the NAIA “A” standard by over one minute. Shawnee State had strong finishers in field as well; Shae Patty tied for fourth place in the high jump by clearing 1.57 meters, while Alexis Putnam placed 12th in the shot put with a throw of 11.37 meters. Niki Young also threw well in the shot put, tossing 11.26 meters. Shawnee State track and field take a break until the spring semester, next competing on Saturday, January 19 at the Dave Lehman Invitational, hosted by Otterbein University. https://www.portsmouth-dailytimes.com/wp-content/uploads/sites/28/2018/12/web1_BrookeSmith_SSU.jpgShawnee State University’s Brooke Smith (Wheelersburg) qualified for the NAIA Nationals in March, along with SSU’s Seth Farmer. Visit http://www.ssubears.com/ for all Shawnee State Athletics updates.